Argyle New Personal Checks display four rotating designs of the argyle pattern in differing colors. The Argyle pattern is made up of diamonds in a checkerboard pattern. Most designs feature overlapping patterns that give a sense of three dimensions, movement and texture. The pattern is derived from the Scottish tartan of Clan Campbell and the patterned socks worn by Scottish Highlanders since the 17th century. 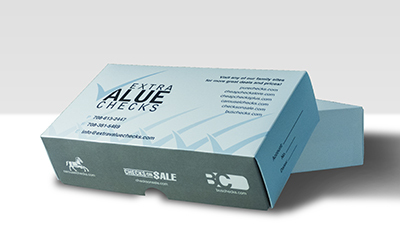 Argyle New Personal Checks are available in single and duplicate check format. Matching address labels and a coordinating checkbook cover are also available.